Most children and young people with an EHCP travel to and from their place of learning with no Council assistance. For example, they might be part of a walking bus, travel independently, get driven by their parents, travel with their parents or siblings on public transport or share a lift with a friend. When this is not possible, students with SEND can apply to the Council for travel assistance for their journey. The Council’s approach to travel assistance is underpinned by the principle of safely maximising the independence of young people now and in the future. A Personal Independence Budget (PIB) paid to the parent, carer or young person. Where travel assistance is requested, a travel assessor will discuss travel options with the young person, parent or carer and will recommend travel arrangements which are most suitable for the child or young person. This arrangement will be regularly reassessed to ensure it remains appropriate to the needs and abilities of the child or young person as they get older. This badge is available for free to passengers with hidden conditions and illnesses that are not easily noticed, such as vision impairments. The badge can be used across the entire TFL network, including buses, London Underground, Overground, and waiting areas on station platforms. TFL have advised that they will not ask customers requesting a badge for their medical history or supporting documentation. This allows free travel on buses and trams for children of school age up until the end of the academic year in which they turn 16. For further information and details about how to apply go to the Transport for London website, your local underground station or post office. The Blue Badge Scheme is a national arrangement of parking concessions for people with severe walking difficulties who travel either as passengers or are registered blind. An accessible and affordable door-to-door minibus service for people who cannot access public transport due to age, disability, or poor health. You can find out more about Ealing Plus Bus / Community Transport here. The London Taxicard Scheme provides subsidised transport in taxis and private hire vehicles (minicabs) for people with serious mobility or visual impairments who find it very difficult or impossible to use mainstream public transport such as buses and tubes. The scheme is managed by London Councils and is jointly funded by Ealing Council and Transport for London. All employees can apply for flexible working if they’ve worked continuously for the same employer for at least 26 weeks. Flexible working arrangements can support parents and carers to drop and pick up children or young people from their place of learning. Ealing Council's travel training enables students with SEND to travel safely and independently to their place of learning. Travel training is a fantastic way to increase confidence and independence and is an important life skill. The training not only allows young people to get to their place of learning independently, but also enhances their social life and ability to access further education and employment as they get older. On average, the training will take 12 weeks, but this might be longer or shorter depending on how long it takes the student and their family to feel confident with independent travel. More independent and confident, and will have gained a life long skill in preparation for adult hood. Able to access further education and employment opportunities in the future. What is a personal independence budget? Personal Independence Budgets are a payment the council makes to families can use to make their own travel arrangements such as paying for bus fares or car mileage. Personal Independence Budgets are a popular travel assistance option for Ealing families, with more and more families opting to organise their own arrangements. Your budget will be calculated for the year and you will receive a payment every four weeks to cover the costs of arrangements which enable you and the young person make their journey. Paying for a parent or carer to travel on public transport with the child or young person. Paying for breakfast or after school clubs that mean families are more able to drop and pick up their child or young person. Flexibility to change timings, which can allow the child or young person to be more independent and access clubs and activities or visit friends after school or college. To apply for, or to discuss flexible working and/or Personal Independence Budgets to support your child or young person’s independence, please contact the Travel Independence Hub at senta@ealing.gov.uk. Ealing Council arranges transport for pupils in some circumstances. This might include minibuses, coaches or taxis depending on the planned routes of vehicles and the needs of the child or young person. 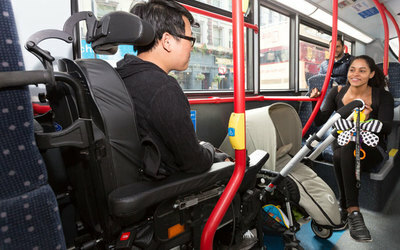 Journeys on arranged transport are generally longer and less flexible than other travel assistance options. Transport is planned to collect a group of children or young people from agreed collection points, although in exceptional circumstances a home pick up may be arranged. Picking children up from collection points reduces journey times and increases social interaction between passengers and families compared to home pick up routes. It enables the young person to make part of their journey independently with or without the support of parent or carer. All staff on transport are DBS checked* and will be qualified and registered transport providers working to the contractual standards set by the Council. *Checks by the Disclosure and Barring Service, which support safer recruitment by preventing unsuitable people from working with vulnerable groups, such as children. Ages 0–5: The Council has no legal duty to provide travel assistance to children under five, however we can provide some support to children in need or in exceptional circumstances. Whether the child lives more than two miles (for children under eight years of age) or three miles (for children over eight years) from their nearest suitable school or college. Wider family context e.g. parents with disabilities, travel arrangements for other children. Whether it is reasonable for the child to walk or travel on public transport without assistance due to their special needs. You can read more about eligibility for travel assistance in Ealing's Independant Travel Policy for Children and Young People up to 16 years of age. Ages 16–25: The Council has no legal duty to provide travel assistance to young people aged over 16. The assistance we offer is discretionary and based on an assessment of the young person’s needs. Applications need to be made before the start of a course. Students applying for courses outside of Ealing can access concessionary travel through Transport for London. You can read more about eligibility for travel assistance in Ealing's Independant Travel Policy for Post 16 Young People Accessing Further Education. If you would like to apply for travel assistance, please complete the application form which will be submitted to Ealing Council's Travel Assessor. To discuss your application or change your travel assistance through Independent Travel Training or a Personal Independence Budget, please contact the Travel Independence Hub at senta@ealing.gov.uk. These are available to download from the right hand side of this page under 'Useful Reading'. Do you spend many hours planning a simple trip out? Have you ever arrived at your destination and found that access wasn’t what you’d been told? Does visiting unfamiliar places cause you stress and anxiety? DisabledGo aims to make going out with accessibility needs a stress-free process by providing FREE detailed, accurate accessibility information. This should eliminate any unexpected situations when going out and give you the information and detail you need to work out if a place is going to be accessible for you. You can search a huge range of places to go in the UK, such as hotels, restaurants, museums, tourist attractions and much more! Visit the Disabledgo website for more information.